The Acceleration, Vibration, and Acoustics (AVA) Project advances the measurement science, develops standards, and provides calibration services for acceleration, vibration, and acoustic sensors and systems that use them. Our program is undergoing major changes by responding to the emerging needs for increased sensitivity, precision, and reduced uncertainty for acoustic devices, accelerometers, and gyroscopes, and inertial measurement units (IMUs). Improvements in acoustic calibrations are needed to support the development of greatly improved hearing aids as an example. 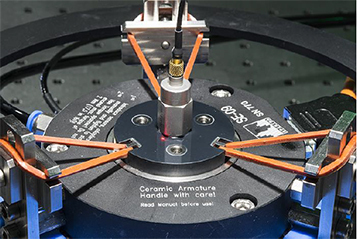 Lower uncertainty and cost calibrations are needed to support the development of low-cost, high-performance accelerometers and gyroscopes for dead reckoning and tilt sensing. Lower uncertainty and cost accelerometer calibrations are also needed for vibration sensing for preventive maintenance. Lower uncertainty and cost shock measurements are needed for injury prevention and remediation in sports as well as personal and military vehicles. New calibrations and calibration protocols are needed for new technologies for microphones and internal devices that are proliferating automotive and consumer electronics. These Microelectromechanical Systems (MEMS) sensor technologies have a projected world market of $22B by 2018, with the use of inertial combos reported to be growing at a 9.8% compound annual growth rate. Working in partnership with the MEMS Industry Group (MIG), our technology roadmap reveals that testing and calibration requirements for accelerometers and microphones are becoming a significant cost driver as more functions are integrated with them. Our goal is to develop new instrumentation and methods to meet these needs. We recently updated our accelerometer calibration service to reduce both the cost and the uncertainty by a factor of 5 and are preparing for a key comparison of vibration measurement capability with other National Measurement Institutes. We just completed an improved gimbal-based inertial sensing calibration system and are in the process of testing it, and we are in the final stages of developing an improved shock calibration system optimized for measuring the types of shock that is common in health and safety applications. We represent the US on the International Bureau of Weights and Measures (BIPM) Consultative Committee for Acoustics, Ultrasonics and Vibration (CCAUV), and chair the Strategic Planning Working Group of that committee. Figure 3. 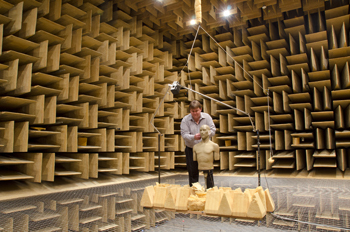 NIST Large Anechoic Chamber for testing hearing aids. Opened for service a new Primary Vibration Calibration System (PVCS) with 5X better uncertainty than the systems that were replaced. iNEMI MEMS Roadmap published in collaboration with MIG. Developed the requirements and purchased a new Precision Vibration Calibration System (PVCS). Established a new IEEE MEMS Testing Standards Committee and published our first documentary standard the same year, winning recognition of the IEEE Standards Association Emerging Technologies Award. Published the MEMS Chapter of the ITRS Roadmap. Began work on the ITRS2.0 White Paper. Led the preparation of and submitted the iNEMI MEMS Roadmap for Review. Completed measurements (feedback suppression and adaptive directionality) on sample hearing aids provided by the VA that are integral for procurements and multi-year contracts. Worked with the MEMS Industry Group to develop Standard Sensor Performance Definitions for MEMS devices, including accelerometers, gyroscopes, magnetometers, and pressure and temperature sensors. Worked with the VA Hearing Aid Contracts Integrated Product Team and Technical Team to develop performance tests for "Hearing Aids and Wireless Systems," that are based on NIST measurement procedures. Formed and led a new ANSI/ASA Hearing Aid Working Group S3/WG48 Subgroup on Hearing Aid Digital Feedback Suppression Measurement. Figure 2. High frequency shaker used with the Primary Vibration Calibration System, capable of sweeping the vibration frequency from 5 Hz to 50 kHz. Provide world-class calibration services for accelerometers and microphones. Develop and standardize test methods for new generations of intelligent hearing aids. Advance the measurement science for test and calibration methods for MEMS accelerometers and microphones. Facilitate the development of industry standards and accreditation for testing accelerometers and microphones. Lead the development of the MEMS Technology Roadmap (published through iNEMI and the ITRS in alternating years), working together with the MEMS Industry Group, to document the critical metrology needs for future MEMS sensor technologies, including accelerometers and microphones. Support the metrology needs of the military and sports equipment manufacturers as they seek to protect soldiers and athletes from shock-related injuries.